This is the legendary blue-flowered poppy that many experienced gardeners seek out. While the moist cool climate of the southern British Columbian coast suits them well, gardeners in Edmonton, Canada (cold continental winters) to Australia (subtropical climate) have had success in growing and flowering these wonderful plants. For some people, growing these plants is a great challenge, for others it is easy. Either way, the stunning blue flowers make everyone want to try. Height 4 feet; spread 18 inches. 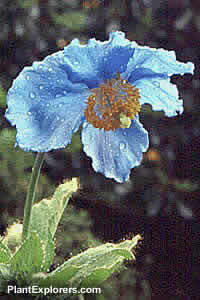 All Meconopsis are open-pollinated in VanDusen Botanical Garden, and therefore may contain genetic material from a variety of species. The seeds have been collected from relatively isolated populations containing plants that most closely resemble the species type, but cannot be considered 'pure'. For maximum freshness, please keep seed refrigerated in its original packaging until it is time to plant. Start the seeds in containers in the early spring in a sheltered location or coldframe. Cold stratification may significantly improve germination. Meconopsis betonicifolia is a biennial, or short lived perennial - Some people recommend preventing it from flowering the first year as it may cause the plant to perennialize. Avoid root disturbance when transplanting. Grow in humusy moist but well-drained slightly acidic soil in part shade.